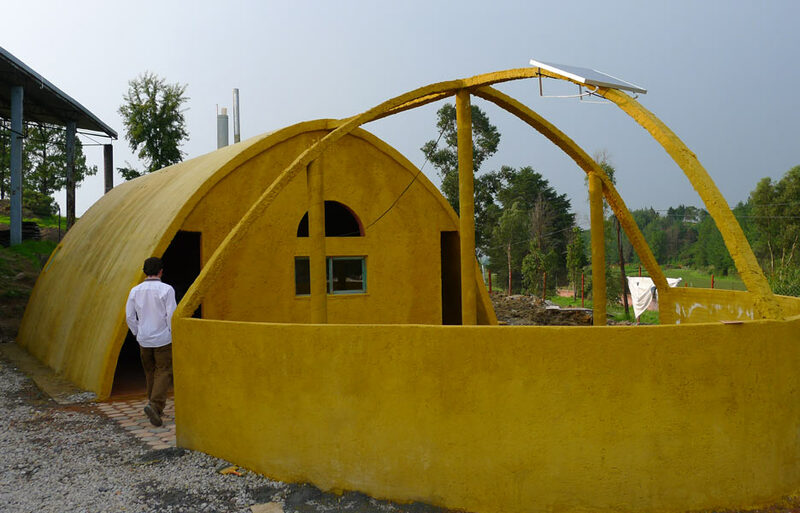 Mobile Workshop Architects is led by Mexican architects, Isaac and Jacob Smeke, based between Sydney and Mexico. On exhibition is one prototype and one dwelling for the Trinidad family (Don Gregorio and Nicolasa and their eight children). MWA see architecture as helping with life – not just shelter but also health and social life. It is not simply the physical requirements that have to be met, but also people’s need to organise themselves into communities, have better health and well-being, and generate wealth that need to be addressed. If architecture provides only the physical fabric, it would have failed. Therefore, MWA’s practice also involves the delivery of social and technological projects. These projects are occasions to harness existing and develop new skills and products, and market and commercialise them. 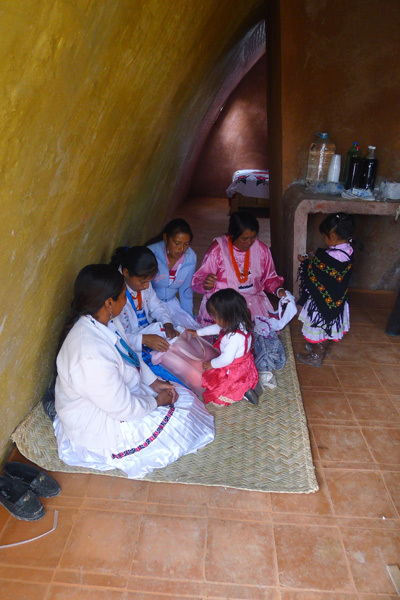 In terms of the social projects, MWA are interested in projects like Patrullitas Ecologicas” (environmental patrols) which generates valuable fertiliser, recycles PET bottles, and builds environmental consciousness in children. 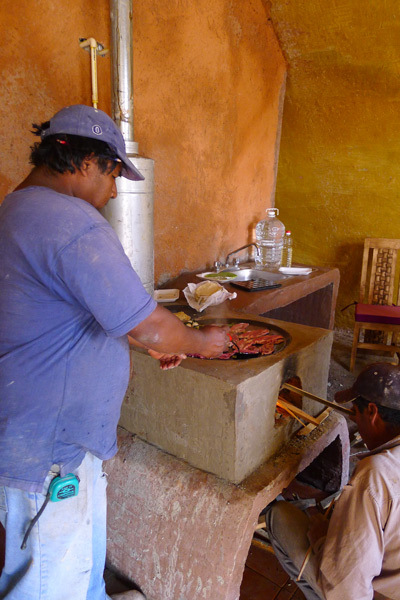 In terms of the technological projects, MWA leads the design of the Biomass stove, which not only benefits the health of women, but it also reduces non-sustainable logging and emission of greenhouse gases. These projects are not merely ‘home-delivered.’ Communities are enabled to apply for and utilise grants from the government through active participation in the project and collaboration with other members of the community, based on the principles of social mortgage along the lines of that advocated by Bangladeshi academic, Professor Muhammad Yunus. While all this is noble and relevant, ‘architecture for humanity’ is actually a long standing stream of architectural practice as NGOs and architects have worked collaboratively for decades in many fragile communities. So what’s different about these projects? First, Isaac and Jacob overtly adopt a moral position, indicating an ownership of these projects. They are not mere facilitators: they are authentically invested in what they build. They ask: “How can you tell people how to live? And, how can you design something you would not live in yourself?” They note, “not because some people are less fortunate economically, or culturally different, we have to see them as second class citizens or impose a westernised idea on how to live but rather celebrate their cultural inheritance and their way of life by learning from their experience.” These questions are confronting. They allude to the discrepancies between design standards and the realities of occupancy, especially exacerbated in the projects for the rural or the urban poor. The expert knowledge upon which the profession of architecture is legitimised is thus subtly exposed. Second, Jacob and Isaac see constraints as opportunities. They are interested not in high architecture, but in designing light-weight resilient structures that are not only affordable and easy to build but also satisfy cultural needs and desires. This is accompanied by the realization that the creative act of ‘design’ is now expanded to include the coordination of different disciplines and stakeholders in the construction of the house and the social and technological infrastructures that animate it. Designed as a linear layout (incorporating living spaces as well as spaces for animals and drying harvest) and enclosed in a self-supporting catenary shell, constructed out of “lightweight structural panel with low density polyurethane infill” that achieves the ceiling height of 3.4 meters. The dwelling is also an integrated unit. 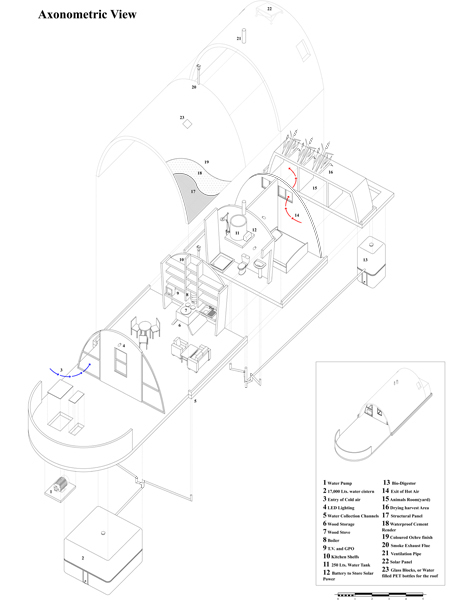 The axonometric view shows its conception as a ‘machine for living in,’ where technology is not added to a static shell but is designed into the envelope. However, the house also responds to the “metaphysical needs” of the people. Jacob and Isaac suggest that instead of importing/imposing the frameworks of western domesticity and interiority, they have paid attention to domestic rituals and a bodily occupation of space⎯sitting on the floor on mats woven out of natural fibres, cooking in a specific way, valuing the use of natural colours, and not preferring to have large openings that may make the occupant feel exposed rather than protected. In other words, the dwelling brings together technical and cultural orientations. Rural Habitat is well timed for its audience in Sydney and at Customs House, as issues of social justice, and the global and ethical role of the architect is now becoming more prominent as a response to the increasing corporatization of the profession.